Honor 8C is now on its first sale in India, and can be purchased through Amazon.in and the Honor E-store. The phone was launched in India last month, and is the latest budget offering from Honor. Starting from Rs 11,999, Honor 8C is available in blue, black, gold, and purple colour variants. The Honor 8C is already available for sale online. While the phone’s 3GB RAM variant is priced at Rs 11,999, the 4GB RAM option is priced at Rs 12,999. Amazon is offering Jio cashback worth Rs 4,450 from the teleco, that will be bundled alongside 100GB free data. Besides that, 5 per cent discount on Honor 8C is also available when shoppers choose EMI payments from ICICI Bank Credit and Debit cards. Through the Honor India website, this budget phone can be purchased alongside Jio cashback worth Rs 2,200, paired with 100GB free data. In addition, those who choose to buy Honor 8C through their Paytm wallets will get a flat discount of Rs 200, that will be valid for December 10. MobiKwik users can also get 20 per cent cashback up to Rs 2,000 with this phone. Featuring a 6.26-inch HD+ display, Honor 8C comes with a screen aspect ratio of 19:9. Running the Snapdragon 632 processor, this phone runs based on EMUI 8.2 over and above Android 8.1 Oreo, and is backed by a 4000mAh battery. Honor 8C can be unlocked through Face Unlock as well as a fingerprint scanner at the back. It comes with 3GB/4GB RAM, 32GB/64GB of internal memory, and expandable storage of up to 256GB. The phone comes with a vertically stacked dual rear camera configuration. This consists of a 13MP primary camera and a 2MP secondary camera. 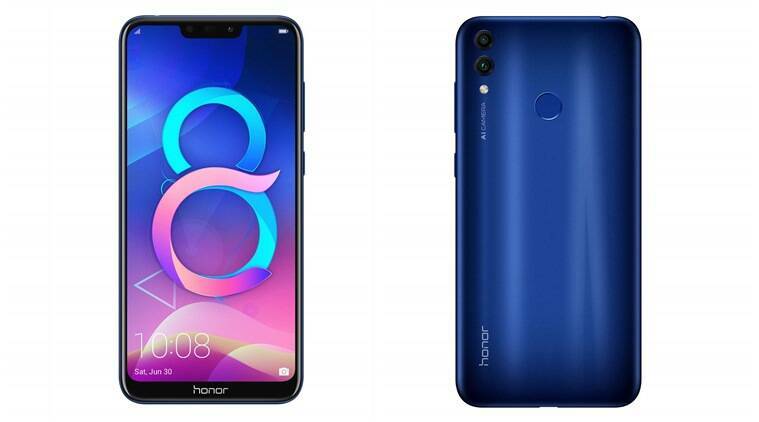 Honor 8C also comes with an 8MP front camera on the display notch. Dual 4G, Wi-Fi, Bluetooth 5.0, and a type-C USB port are among the phone’s connectivity options.